Investing in the future of the Jawoyn people. Image courtesy of Cicada Lodge, shot by Peter Eve, Monsoon Design. 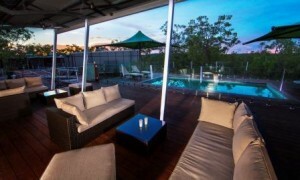 Cicada Lodge is a luxury resort in the Nitmiluk National Park. Nitmiluk Tours, owned and operated by the Jawoyn Association, operates tours and cruises to Nitmiluk Gorge, as well as kiosks, cafes and accommodation. Wes Miller, Chairman of Nitmiluk Tours, said: ‘The key benefits this project will provide to the Jawoyn people are long-term training and employment opportunities, particularly in hospitality and tour guiding. Cicada Lodge sits on the edge of the Katherine River and provides tourists with an authentic Indigenous cultural and wilderness experience. Open all year, it offers guests scenic flights, access to rock art sites, and cultural experiences such as bushwalks and bush tucker. Nitmiluk Tours also negotiated with the contracted construction company to purchase its demountable site buildings once the development was completed. The buildings have since been converted into much-needed staff accommodation for future Indigenous employees. IBA and the Jawoyn Association have a good record of joint investment. The organisations acquired Jawoyn Cruises in 1993 and the Association bought IBA’s share within eighteen months. IBA looks forward to another successful partnership. Wes is also delighted with the partnership and said: ‘I am very excited about the potential of Cicada Lodge to increase the number of people from Australia and overseas who can come to this beautiful part of the world and immerse themselves in our country and our culture. ‘The Cicada Lodge development would not have happened without IBA’s support as a partner. History has shown that Nitmiluk Tours and IBA work well together and I expect that it will only get better as the project continues.